RSR Trying to Launch Flat-earther into Space. Really! See (or give) at Kickstarter Launch a flat-earther into space. We've already raised more than $34,000! Bob Enyart and Fred Williams announce the Real Science Radio Kickstarter project, Launch a flat-earther into space! After hearing from the garage door guy who stopped by the studio to pick up a check, and from Lou Monte singing the ole' favorite, Please, Mr. Columbus, the guys list some of their own experiences and observations of the spherical earth having traveled the globe. - Starting with an example close to home, many times they've both driven Interstate 70 from Kansas to Denver seeing the upper portions of the Rocky Mountains 14,000-foot peaks looming long before seeing the nearer foothills and Denver's skyline. - Bob saw the same effect driving the Alaska-Canadian Highway to Fairbanks and for many hours seeing the upper part of the 20,000-foot Mt. McKinley (now Denali) before the lower portions of the mountain became visible. - The guys also described seeing the Southern Cross constellation in New Zealand, only visible from the Southern Hemisphere. - All the stars down under rotating around the sky in the opposite direction as the counterclockwise rotation they travel around Polaris in the northern hemisphere. - The opposite rotational directions of hurricanes in the southern and northern hemispheres. - The guys have sailed and seen the mountains behind the seaports before seeing the cities including Seattle, Anchorage, Athens, and Ephesus. - Like Luigi's crow's nest on Columbus' ship, builders through the centuries have so equipped their ships. - Using levels and plumbs anywhere on earth point to the center of gravity, i.e., straight downward, which is one reason why flat-earthers deny gravity. - Then the guys extend their own experiences with the firsthand testimonies of friends and those interviewed on RSR including the fourth man to walk on the Moon Commander Alan Bean, Dr. Henry Richter scientific equipment designer for our earliest lunar missions and satellites, one of the world's leading telescope designers, and ground system administrator for NASA's Cassini Saturn mission. * RSR Proposed Flat-earth Experiment: At any long and especially level stretch of land or water (like at the Bonneville Flats, a broad canal, etc.) on a clear night position two spotlights (searchlights) so that they are physically touching each other. Aim them into the sky in a v-shape. Then travel in a vehicle perpendicular to the vectors of the beams while videotaping the v with live GPS output (lattitude and longitude coordinates) embedded onto the screen and make sure each mile is clearly marked. The vertex is where the two vectors meet (where the spotlights are physically touching each other). Note the distance on a spherical earth at which the vertex is expected to drop out of sight. Then note whether the vertex actually does disappear (while the beams remain visible) and the measured distance at which the vertex disappears. Continue traveling away from the spotlights and as the distance increases, note whether the distance increases between the visible bases of the two vectors. The brightness of the spotlights and the clearness of the evening will determine the distance at which the beams are still visible which may be as far as 100 miles or more. Continue the experiment until the beams are no longer visible. * Paranoia Explains Today's Flat Earth Syndrome: Ten percent of Frenchmen (and women) believe that the Earth may be flat. This modern phenomenon reveals not a scientific hypothesis but a slow-growing symptom of distrust and paranoia caused by widespread fake news and other environmental factors. In the U.S., 34% of Americans 18 to 24 years old are unsure about whether the world is a sphere, with three million of that group claiming the world is flat. (The percent of the population convinced the world is round gradually approaches 95% as ages increase to over 55.) Despite having access to more information than any time in history, an alarming number of people are falling into the trap of believing the myth of a flat earth. Many of these are Christians who unwittingly play into the hands of atheists who have long ridiculed the Bible as teaching a flat earth (its ironic that the president of the Flat Earth Society is, in fact, an evolutionist!) Believing this myth is a direct attack and insult to the Book of Genesis which from chapter one teaches that God created the Earth, Sun, Moon and stars for signs "and seasons". Scientists and Bible scholars have held for centuries that the earth is a sphere. Among these scholars is the prophet Isaiah, who wrote that God "sits above the circle of the earth" (Isaiah 40:22), using a Hebrew word that means both circle and sphere (see below). * Flat Earth Society President Believes in Darwinism: As reported by LiveScience and in Creation magazine's Fall 2011 issue, the Flat Earth Society's president Daniel Shenton not only believes that the earth is flat, but he also believes in global warming and he's a Darwinian evolutionist. Ha! The irony of course is that evolutionists mock creationists by asking if we believe in a flat earth, whereas the Flat Earth Society itself aligns itself not with creationists but with evolutionists. * Flat Earth, Geocentrism, and the Moon Landing Hoax: LiveScience reporter Natalie Wolchover offered to Shenton a NASA image of our western hemisphere which should lead the Darwinist flat-earthers to wonder where Europe, Africa, and Asia were hiding. And by the way, those who still claim that the sun orbits the earth have far more supporters than do the flat-earthers. For a rebuttal to that view, see rsr.org/geocentrism-rebuttal. And for a rebuttal to the moon landing hoax conspiracy claim, please see rsr.org/moon-landing-hoax-refuted. * UC History Prof. Debunks Myth of the Flat Earth: Dr. Jeffrey Russell, Professor of History at the University of California, Santa Barbara, has also taught history and religious studies at Berkeley, Harvard, and Notre Dame. His book, Inventing the Flat Earth, documents that in the 19th century a French archaeologist and an American essayist invented and spread the falsehood that educated people in the Middle Ages believed that the earth was flat. RSR notes that the anti-Christians spreading this fabrication allegedly include some of Darwin's promoters like David White, and that the targets of this smear included Christian scholars. Prejudice and myth die hard, and a small army of professional historians have been unable to correct this evolutionist libel against Christians. 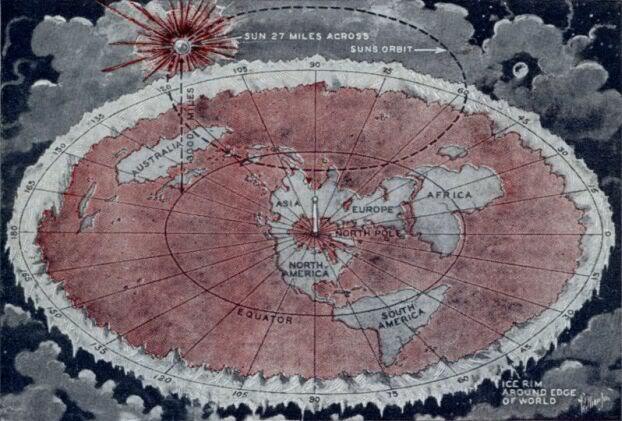 Toward that end, however, see Dr. Russell's brief article, The Myth of the Flat Earth. Russell there mentions the widespread false belief that in 1491 Christopher Columbus faced inquisitors and theologians who held that the Earth was flat, which mini-myth has been widely debunked and identified as a pure invention of the author Washington Irving. * Christian Orders that Taught a Flat Earth: First, the Christian religious orders, denominations, etc., that have never taught a flat earth include Franciscans, Dominicans, Augustinians, Benedictines, Trappists, Carmelites, the Eastern Orthodox, Roman Catholic, and Protestant denominations. The Christian orders, denominations, creeds, etc., that have taught that the earth is flat is NONE. * Isaiah: God "sits above the circle of the earth": From above, and from every direction, a solid sphere can only be viewed as a circle. Dominic Stratham's article, Isaiah 40:22 the Shape of the Earth, provides many indicators that khûg, the ancient Hebrew word used 2,700 years ago, typically translated into English as "circle", also means sphere. In modern Hebrew both khûg and kaddar mean sphere, as do similar words in other languages, whether possibly coincidental or borrowed or cognate, as with Arabic kura (which word appears in this verse in the most popular Arabic Bible which was translated in 1865). An old German word kugel, the Polish word kula, and the Serbian/Croatian word kugla all mean sphere apparently from the Proto-Indo-European root gug. Also, the pre-modern era renderings of this word khûg as an orb include Bible translations in the 1500s, as sphaera. * NASA's lying! Previously, that simple single sentence summed up the conspiracy part of the flat-earthers claim. NASA's lying. But then, well, Russia started lying too, even though the Russians hated the Americans, for some reason, their lie covered up for our government’s lie. But then, the Chinese, who hated everybody, starting lying also with their orbital launches, spaceships and satellites. And then Japan, even though they hated the Chinese and the Russians, they told the same lie. And then India, and Israel, and Iran, and even North Korea, all with space capabilities, all supported the same lie. Then it turns out, Elon Musk is lying regarding his SpaceX private company! And Boeing, and Amazon’s Blue Origin with Jeff Bezos, and Lockheed Martin, and McDonnell Douglas (Bob used to work for them), and Richard Branson’s Virgin Galactic. So, it went from NASA’s lying, to NASA and Russia, and China, and Japan, and Iran, and Israel, and SpaceX, and Blue Origin, and Virgin Galactic, and Andrews, and Bigelow, and dozens of other companies, all combined with tens of thousands of engineers and scientists, are ALL lying. Right. - RSR's Interview with James Hannam on the medieval world. And remember that in the most ancient book in the Bible, at Job 26:7, written almost 4,000 years ago in the time of Abraham's great-grandchildren, we read an amazing statement consistent with astronomy's latest models of the solar system, that God "hangs the earth on nothing." [In his famed paper, Theodosius Dobzhansky's] first prediction regarded Saudi Arabia’s late Sheik Abd el Aziz bin Baz, who had recently insisted that the sun orbited the earth. Dobzhansky declared that it would be useless to present evidence to those who “fear enlightenment,” asserting that the Sheik was “so hopelessly biased that no amount of evidence would impress him” (Dobzhansky, 1973, p. 125). However, in 1985 the U.S. invited Prince Sultan bin Salman to fly aboard the space shuttle Discovery. Later, hearing a firsthand account of the evidence from a source that he trusted, bin Baz changed his mind, falsifying Dobzhansky’s prediction (Bin Baz, 2005).